Philip Glass arrives in town this Friday to appear as part of the Chicago Humanities Festival, but he's no stranger to the city. He first came here in 1952 to begin his undergraduate studies at the University of Chicago at the prodigious age of 15. He remembers sitting outside jazz clubs like the Beehive in Hyde Park, too young to be admitted, listening to bebop waft out the door. Almost seven decades later, Glass is arguably America's most famous living composer and considered something of a national treasure—in 2015, Obama awarded him the National Medal of Arts. He's using his current visit to Chicago to correct an oversight of long standing. Though he's well-known for composing, performing, and thereby defining "minimalist" music, Glass has somehow never before written for the minimalist ensemble par excellence: the percussion ensemble. Prompted by a commission from Third Coast Percussion—the Chicago quartet of David Skidmore, Robert Dillon, Peter Martin, and Sean Connors—Glass will present the world premiere of his first-ever work for percussion ensemble during a CHF event at the Francis W. Parker School. The evening will begin with a solo piano performance by Glass, followed by a discussion between Glass and Skidmore and Third Coast's debut of the three-part, 20-minute Perpetulum. Glass's style of minimalism, which he once called music of "repetitive structures," is unmistakable once you've heard it. Typified early in its history by his group the Philip Glass Ensemble—which used mostly amplified winds, keyboards, and voices—it's characterized by rising-and-falling pulsed patterns, steady rhythms, meditative passages of harmonic stasis, and nonstop melodic momentum. Over the years Glass's trademark arpeggios have permeated pop culture as well as the classical sphere. He's written a long list of film scores—Koyaanisqatsi, Candyman, The Truman Show, The Hours—and made an infamous fictionalized cameo on South Park. "The thing about Philip Glass is that he's been part of the fabric of music and culture for so long," says Martin. "I knew who Philip Glass was from just watching movies—I remember seeing Candyman in the mid-1990s. He's been part of everything, so in that sense, his aesthetic and musical voice probably has been a part of Third Coast Percussion for a much longer time." For Martin and the other members of Third Coast, their first deep dive into Glass came when they were students in the 1990s and encountered his landmark 1976 opera, Einstein on the Beach. "I had a very hip high school music theory teacher who just kinda blew our minds one day," says Skidmore. "She was like, 'There's this opera by this guy named Philip Glass,' and she just hit play." Connors admits that he downloaded this minimalist classic in the dial-up days of Napster—and given that it's more than three hours long, even in its abbreviated recordings, that must have taken forever. The 81-year-old Glass comes to Chicago in the midst of a busy performance schedule (which may help explain why he didn't respond to multiple requests for comment). In late October, he and his ensemble played his three-and-a-half-hour mid-70s masterpiece Music in 12 Parts at New York's Town Hall, followed last week by a sold-out run of his 1980 opera Satyagraha at the Brooklyn Academy of Music, which he attended on opening night. Sometimes Glass seems to have done it all already—he's written for myriad musical legends, among them the Kronos Quartet and the Los Angeles Philharmonic, which will premiere his Symphony no. 12 in January 2019. But Third Coast Percussion found something he hadn't done—and more important, they persuaded him to do it. It's incredible that a commission like this didn't happen sooner. 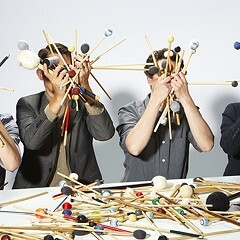 Modern classical percussionists are raised on minimalism, in part because minimalist composer Steve Reich (a Glass contemporary and himself a percussionist) has written so extensively for percussion ensemble. Third Coast won a Grammy last year for their album Steve Reich, which collects works ranging from 1973's Music for Pieces of Wood to 2009's Mallet Quartet. Unlike pianists or string and wind players, percussionists have no "classics" from the 18th and 19th centuries by the likes of Bach, Mozart, or Beethoven. 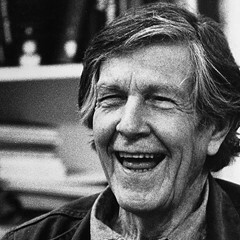 People have been drumming for millennia, but the earliest known Western classical works for percussion ensemble—by John Cage and Johanna Beyer, among others—are less than 90 years old. 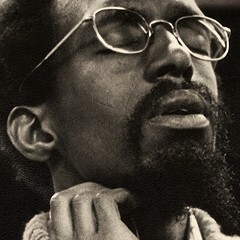 The members of Third Coast point out that composers such as Cage didn't just write for percussion; they also performed in their own repertory groups, creating a trend of hybrid composer-performers in percussion chamber music. "The music you write is different when you're the one performing it," Dillon notes. Composer-performers can take their own technical abilities and stylistic sensibilities into account. This has historical precedent, but only to a degree: Mozart, for instance, wrote piano concertos he performed himself, but he didn't create a "Mozart Ensemble" that toured Europe playing exclusively his music. In December 1938, Cage staged the first concert for classical percussion ensemble at Cornish College of the Arts in Seattle (where this writer teaches). For the occasion he assembled an ensemble, and he then toured with it around the western United States. Thirty years later, Reich and Glass updated that composer-performer model, playing in each other's groups from 1967 till '71. At that point they parted ways, forming the Philip Glass Ensemble and Steve Reich & Musicians and performing only their own works. The members of Third Coast, who founded the group in 2005, look back to Glass and Reich's period of cooperation and see a clear historical model for their own distinctively collaborative style as composer-performers. That same period—minimalism's formative years, roughly 1967 till '71—also helps explain Glass's percussion-writing lacuna. In 1967, after returning from studies in Europe, Glass attended a New York concert of Reich's Four Pianos (an early version of Piano Phase). The two composers had met in the late 1950s as fellow Juilliard students, and after this concert they began collaborating regularly. Along with composer-flutist Jon Gibson, they convened for weekly sessions with an idiosyncratic, cloak-and-helmet-wearing composer, poet, and theorist who called himself Moondog (aka Louis T. Hardin, who was then living with Glass). This group played Moondog's music exclusively, and they recorded some of the sessions, usually with instrumentation of flute, shakers, and voice. A selection of these recordings was released in 2007 to accompany Robert Scotto's biography Moondog: The Viking of 6th Avenue. In his preface to that book, Glass writes, "We took [Moondog's] work very seriously and understood and appreciated it much more than what [Reich and I] were exposed to at Juilliard." In 1968, Reich and Glass began performing not just Moondog's music but also each other's. For a concert in May 1969, Glass played percussion on Reich's new work Four Log Drums, for which Reich used a machine he'd devised to send each drummer's headphones a different guiding metronomic pulse, all slowly shifting out of phase with one another. Reich's device was temperamental, however, and Glass later called it "a disaster." A tactful friend, he added, "But we all have disasters!" 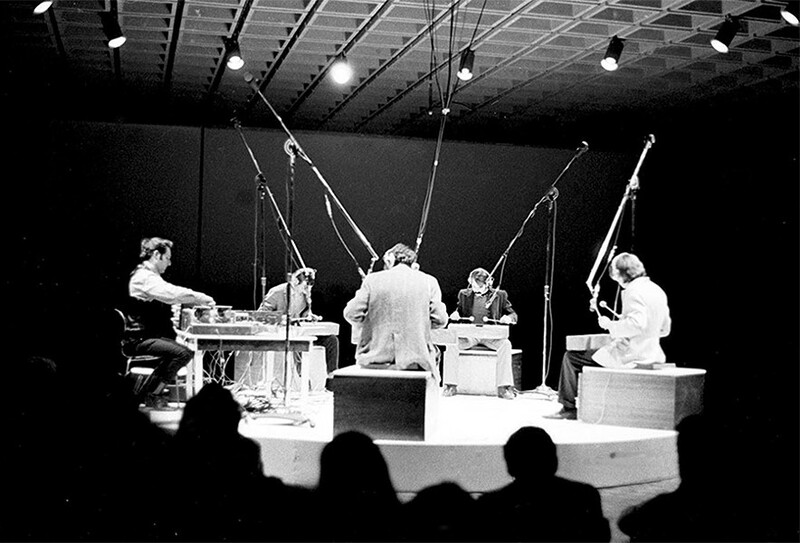 Steve Reich (left) guides Philip Glass, Jon Gibson, Richard Landry, and Arthur Murphy in a performance of his new work Four Log Drums at the Whitney Museum of American Art in 1969. During the growing pains of minimalism in the late 60s, as composers tried and often failed to work out the glitches in their processes, audiences and critics struggled to acquire a taste for the music. In January 1970, when Reich performed keyboard for the premiere of Glass's Music in Fifths, the New York Times called it "a waste of time." 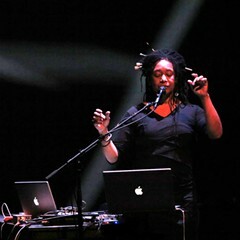 Later that year, Glass performed on the premiere of Reich's Four Organs, which the Times likewise panned, though in more mixed terms—the reviewer admired Reich's "single-minded fervor," but wondered why these performers should play such repetitive music "when machines can do it so much better." Nonetheless Glass and Reich continued collaborating, even gaining some steam—they toured France, Germany, and England together in early 1971, sharing various personnel, including Gibson, Arthur Murphy, and Richard Landry. When asked in the mid-1970s what drew this group together, Glass responded, "I think an interest in the work and an interest in each other." As musicologist David Chapman has shown in his lengthy study of the history and membership of the Philip Glass Ensemble, much early minimalist music grew out of this mixture of collaboration, friendship, and mutual support. By the end of 1971, however, the collaborations between Reich and Glass were over. After a feud that neither man has explained publicly, they became estranged and ceased working together for decades (their next collaborative performance was a reunion in 2014). This schism affected the instrumentation each composer employed individually: on those European tours they'd shared electric keyboards, but after their falling out, the Philip Glass Ensemble used primarily amplified winds, keyboards, and voices, while Steve Reich & Musicians centered on percussion (Reich wrote his famous work Drumming in late 1971). It would be almost 50 years before Glass wrote Perpetulum. 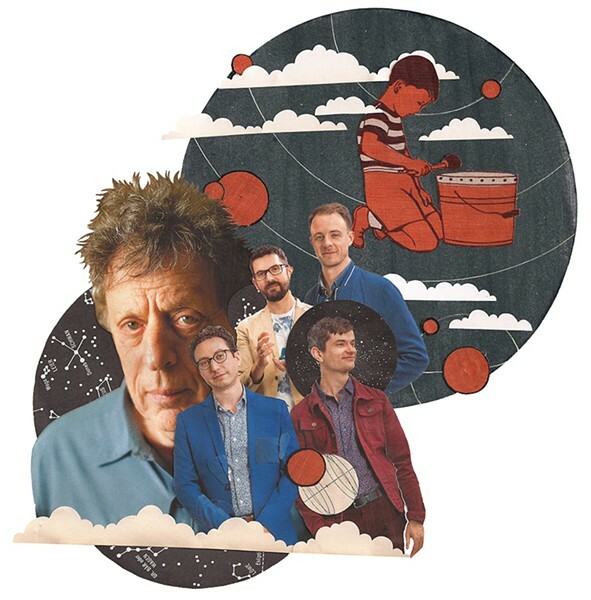 Commissioning Philip Glass is part of a larger initiative for Third Coast Percussion. As they look back at the history of Western classical music, it's tempting to wonder, says Skidmore, what kind of percussion quartet the likes of Stravinsky or Bartók might have written. It's a torturous counterfactual thought experiment, and everyone has their own dream list (just imagine if Julius Eastman or Maryanne Amacher had written one). Dillon adds: "We look at all the great composers who, if they had written a percussion ensemble piece—if someone had asked them or hounded them to write a percussion quartet—how much different would our whole genre be?" The commission did require persistence—Third Coast reached out to Glass for "years and years and years." A composer of Glass's stature must be commissioned long in advance, so Perpetulum has been brewing for some time. Skidmore believes the key was being "patient and friendly but insistent," and that patience was possible, he notes, because Third Coast are an established group with a functional development infrastructure—the processes to sustain the ensemble long-term are up and running, which means they can plan far into the future while projects seeded years ago come to fruition in the present. Perpetulum (a hybrid word suggesting both "perpetual" and "pendulum") wasn't delivered already done but instead arose from collaboration between Glass and Third Coast. 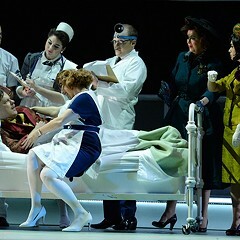 This began in April 2017, when the composer met with Skidmore while in town for a Chicago Opera Theater production of his The Perfect American. After that initial meeting, Glass and Third Coast maintained frequent dialogue. "He calls pretty regularly, actually, to talk through revisions," says Skidmore. "We'll go back and forth. He'll send a new idea, his copyist will try it out, we'll record it, he'll call and ask what we think." This collaborative style has become a hallmark of Third Coast's creative process. They're not only an unusually close-knit group (they write music collectively, such as this year's program-length composition Paddle to the Sea) but also tend to work hands-on with the composers they commission. For example, they ask each participant in their Emerging Composers Partnership to attend at least three workshop sessions at the ensemble's Ravenswood studio. Due to Glass's busy schedule, though, much of their collaboration happened via phone or Skype. Dillon explains that Perpetulum assigns each player a pitched instrument (marimba, vibes, xylophone, tuned metal pipes) as well as some nonpitched percussion (cymbals, drums). Between the second and third parts, Glass has included a cadenza, a free-form virtuosic passage more commonly found in a piano concerto than a percussion quartet. "When we were talking with Philip about what he was thinking," says Martin, "he actually mentioned it could be a situation where it was all nonpitched percussion and all completely improvised, like very jammy sounding." That's not Third Coast's style, though. "We like sculpting things, so our cadenza is highly sculpted, every single note." Dillon adds: "It allows room for us to really make the piece our own, where we can highlight our favorite parts of Glass's style and also sound like us." Martin hopes the cadenza will encourage future performers to customize the quartet. "I think time will tell what the life and the legacy of this piece is," he says, "but it will be interesting to see how different ensembles interpret that—and hopefully they will interpret that in their own voice." Skidmore sees Perpetulum as an interesting way to graft keyboard percussion sounds (marimba, vibraphone) onto Glass's approach to percussion in his symphonies. "His percussion writing up until recently has been very focused on traditional orchestral percussion instruments—snare drum, bass drum, triangle, tambourine—and these kind of motor rhythms, in symphonies especially," he says. Glass has long written for keyboards (piano, organ), but not for keyboard percussion. As Martin says, "This is not early Glass music at all," but it's continuous with that style in that "there's a lot of energy throughout the piece." Friday's concert has long been sold out, but Perpetulum will be released in March 2019 via Glass's label, Orange Mountain Music, on an album that also includes Gavin Bryars's The Other Side of the River and multiple new works by Third Coast. Dillon says these pieces "reflect the influence of Glass but also connect a bit to our roles as composer-performers." 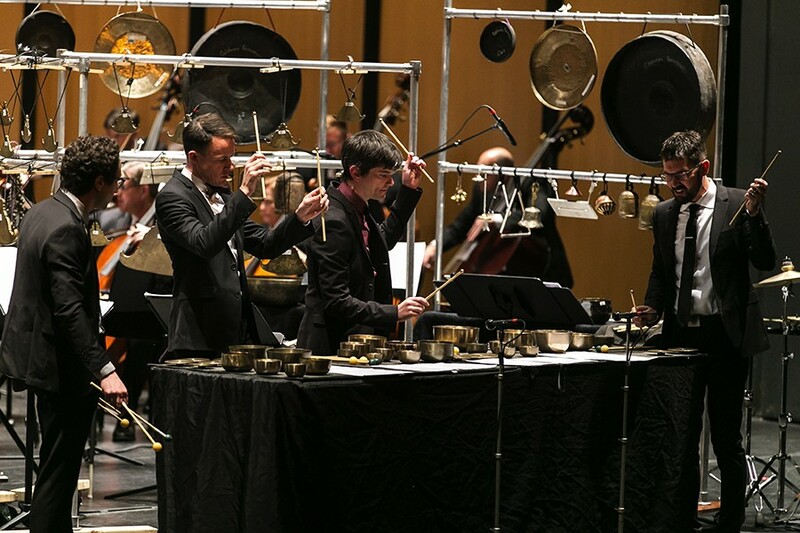 Third Coast Percussion perform their first commissioned concerto, Augusta Read Thomas’s Sonorous Earth, at the Harris Theater in November 2017. The broader classical music scene has long favored canonical works by long-dead "masters" and commissions from famous living composers, rather than music by newer, untested figures. Mainstream programming rarely features women or people of color—the Chicago Symphony Orchestra's 2018-2019 subscription season, for instance, includes no women composers. Name recognition sells, and that leaves less room for emerging voices. Given this lack of equitable representation, why commission Glass, who has more opportunities than he can possibly accept? Though he'd never written for percussion quartet before, many of his contemporaries still haven't—among them Tania León, George Lewis, and Pamela Z. To commission such a towering eminence requires a significant financial commitment, which is made clear by the long list of funding partners for Third Coast's work with Glass. In addition to a grant from the Maxine & Stuart Frankel Foundation, money came in from several co-commissioners, many of them venues or presenters who wanted to secure a concert: Elizabeth and Justus Schlichting for the Segerstrom Center for the Arts, the Bravo! Vail classical music festival, San Francisco Performances, Town Hall Seattle, Performance Santa Fe, and the University of Notre Dame's DeBartolo Performing Arts Center. The list doesn't even end there: the project got additional support from Third Coast board members Friedrich Burian and Bruce Oltman, MiTo Settembre Musica, the Saint Paul Chamber Orchestra's Liquid Music series, and the Percussive Arts Society. Third Coast also see objections to working with Glass as representing a false choice—such a project doesn't prevent them from also nurturing up-and-comers. 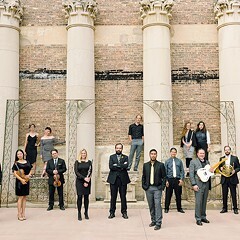 The Emerging Composers Partnership, launched in 2013, uses an open call to solicit works by lesser-known composers—Third Coast's website says its aim is to "provide the Chicago contemporary music scene with premieres of works from the brightest rising stars in the composing community" and to promote "inclusive commissioning of new music." The composers who apply for this program aren't well-known today, but they might be the greats of tomorrow. "It's a very intimate thing that we're doing—it's not a cattle call," says Connors. "It's two people per season, so it's really building a relationship, and then we become partners with them forever. They'll be in our network, we'll be their big supporters, and hopefully we'll work with them in the future." Third Coast has also sought out collaborations with artists famous outside classical music, such as pop polymath Devonté Hynes of Blood Orange and Wilco drummer Glenn Kotche. These partnerships, much like the group's work with Glass, raise Third Coast's profile and build their audience, putting them in a better position to advocate for unsung composers. The necessity to balance historical figures against diverse new voices is a delicate problem for everyone in classical music, and Third Coast are among the best at advocating for open and equitable access to this cultural space. Audiences will doubtless rejoice that Glass has finally written a work for percussion ensemble, and percussionists will surely be relieved that no one will need to wonder 50 years from now what might've happened if only someone had asked him. But in seeking to commission already established "great composers," Third Coast risk reinforcing the biased system by which these composers first became known as great. Rewarding the already rewarded can create a self-sustaining cycle: opportunities beget more opportunities, and commissions beget more commissions. Glass and Reich themselves have recognized this cycle and provided a precedent for disrupting it: After they formed separate ensembles, they also founded their own nonprofits, the Reich Music Foundation in 1971 and Glass's Aurora Music Foundation in 1975. Through these platforms, both men have used their prestige on behalf of less famous artists. In 1978, for instance, the Reich Music Foundation's Young Composers Concert Series featured pianist Ursula Oppens, and in 2012, the Aurora Music Foundation hosted the three-day festival Philip Glass: Music With Friends, featuring collaborations with the likes of performance artist Laurie Anderson, actor and singer Tara Hugo, trumpeter Nate Wooley, and composer Tristan Perich. For ensembles today, choosing whose music to perform or commission isn't necessarily a zero-sum game. Budgets often are, though—you can't spend the same money twice. Deciding what resources to allocate to which initiatives will remain an ongoing concern for Third Coast. It's not simple math, either. Funding opportunities often present themselves more abundantly when a group commissions a famous composer such as Glass, and in turn that fame can rub off on the group, giving a boost to lower-profile projects yet to come. By commissioning Glass while piloting their Emerging Composers Partnership, Third Coast both participate in and help write the history of percussion music. "One of the big points of that partnership is to find new voices and to encourage them . . . to not only write music, but percussion music," Skidmore says. "Some of the people who we are able to work with in the ECP will one day be the next Meredith Monk, Philip Glass, Devonté Hynes, whoever. And how cool is it that at the onset of their career they're asked for percussion, that that becomes a part of their voice early on? So there's also an aspect of cultivating a future of composition in percussion." The Emerging Composers Partnership certainly helps with the "great composer" problem, but one future challenge for Third Coast Percussion will be to avoid seeing it as the solution. As UK-based feminist writer and scholar Sara Ahmed notes in her book On Being Included: Racism and Diversity in Institutional Life, "Solutions to problems can create new problems." Once people feel they've done enough, they can let themselves off the hook.